Striking bands of grasses blowing in the wind…braided paths flanked by native flora…canyons, waterfalls, streams and rock bridges. What seems like a hike through one of the many spectacular environments of the Front Range is the experience a visitor to the Northern Colorado Water Conservancy District campus is likely to have. Utilizing native and xeric plant material, BHA Design created an interpretative landscape that compliments the surrounding agricultural vernacular. As a focal point of the landscape design, native sandstone, shrubs, grasses and flora were employed to create an artistic interpretation of the Colorado Big Thompson Project (CBT). The District uses the interpretive area as an educational tool to teach the public about water conservation and distribution of water throughout northern Colorado. 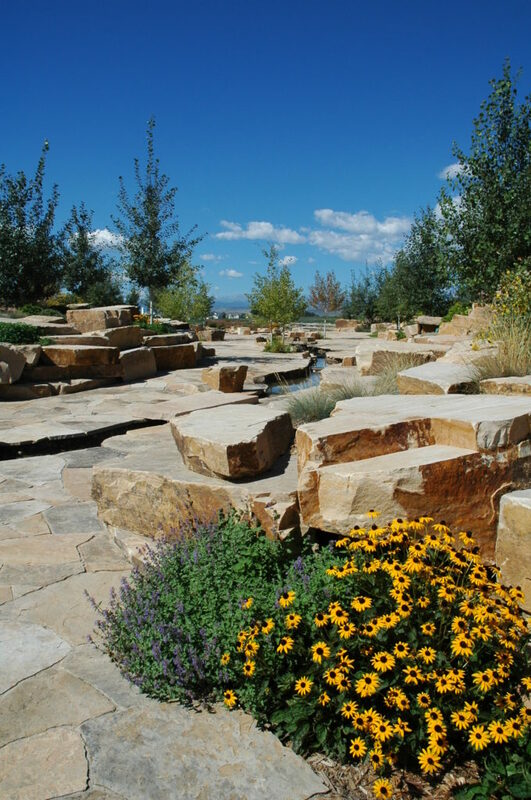 This project received a 2005 Merit Award from the Colorado Chapter of the American Society of Landscape Architects. As part of the design of the new NCWCD headquarters, BHA designed an outdoor interpretive area that is used to educate the public on the conservation and distribution of water throughout Northern Colorado. This project is designed to save 70% of water normally used for a traditional bluegrass lawn approach.